Sweetman Illustrations: First image to share! Finally, after these last couple of weeks, I have something to post. I've been working on a children's book for a class project and I thought I would share both the final image of one page as well as the uncolored inks. Notice the change in the Dragon character. 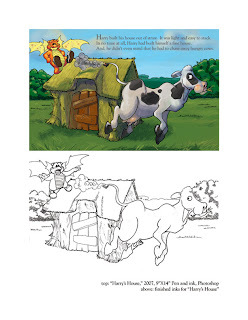 My brother pointed out that the original expression would be when the dragon notices the cow eating his house, but the cow has already started running away. So, I redrew the dragon to be smug and self-satisfied and replaced him with Photoshop. A little color later, you'd never know the change.